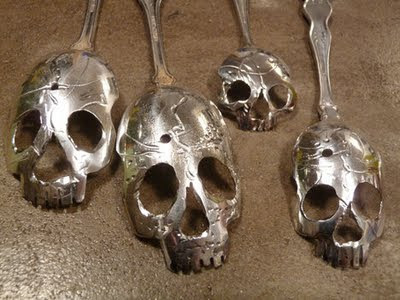 Now I'm not going to try to convince you that they're the world's most practical items, but these skull spoons are beautiful. They are clearly little works of art and, while I wouldn't fill the silverware drawer with them, I could see displaying one under a bell jar. And for $45, it's a pretty affordable piece of art, too. (I know that's a bit expensive for a single spoon, but this is art, not cutlery.) To order one, email the artist, Tom Sale, aka Pinky Diablo.